You are all set to have a blast at Dreamforce, the Super Bowl of Software. Your mind is spinning with the list of people you will meet, the conversations you’ll have and the promises you will make. You will come back to the reality of your office and send out emails to the thousands of leads you’ve collected at the world’s biggest software conference this year. But SMS texting may be a better choice. Speed– How to be the first to follow-up with attendees. Attention– Breaking through the clutter of hundreds of emails your competitors are sending. Focus– Sending the right message to the right audience. Engagement– Campaigns don’t work anymore; how do you initiate conversation with your prospects? Relevance– Sharing the right industry information, resources and content with the huge database that you now have. Quick– 90% of texts are read within the first three minutes. Distinctive– It’s hard to stand out with email when 269 billion emails are sent daily. It’s a bit easier to make a distinct impression when you’re only competing with 22 billion daily text messages. It also helps that U.S. consumers are spending about 26 minutes a day texting; sending and receiving an average of 32 messages, more time than they spend on email. Accurate– You can segment your leads by industry, for instance, so that you can compose a message that will resonate best with your different audiences. 2 way communication– When you motivate your leads to respond immediately to your CTA, texting is an easy option for them to do so. Versatile– The 160 characters available force you to be direct. So, your leads are more likely to read the links or tips you share. Work in advance– As our client Christina Randell (President, MyEducationSolutions) says, “our clients live on their phones, not their email.” Just like you use marketing automation to send emails, you can set up your SMS automation to text your leads. Do this before Dreamforce, so that there is less work on your plate when you come back and deal with the rest of your backlog. 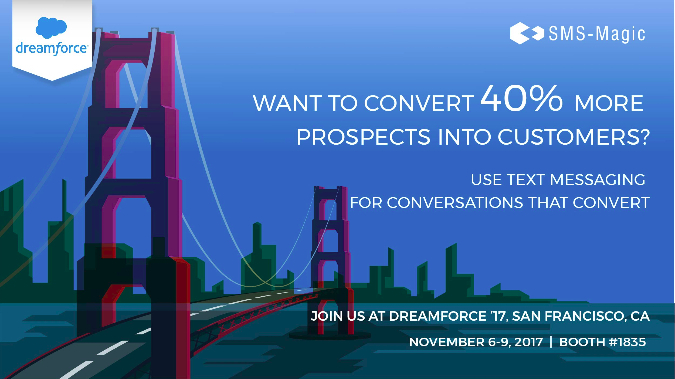 Get more leads– At your Dreamforce booth, display a keyword with a short code that visitors can use to text you to know more about your product. This way, you will easily get their mobile phone numbers. Do quick follow-ups– Also, you can send a text to leads you have met at your booth. Send this text within an hour, while you are still fresh in their minds. You could include a link to a video, which will be easy for them to view when they have a free moment. Personalize– Once you are back from Dreamforce, you can personalize the SMS template you created earlier if you want to add a detail to jog a lead’s memory. See what else we’ve got going on at Dreamforce in Booth #1835. We hope to see you there!